I got my first race of the season under my belt and I sure picked a tough one! But I have to say that the race course, and venue at Oak Mountain State Park, was absolutely beautiful. 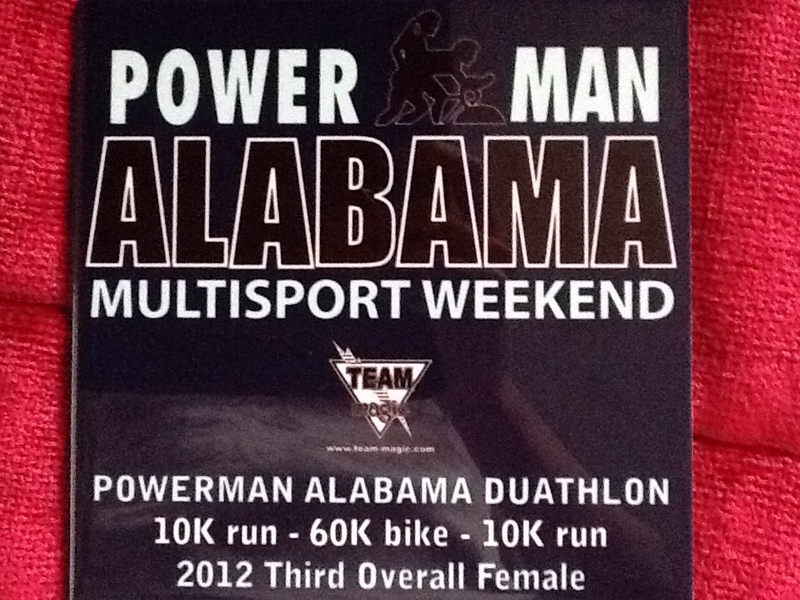 I highly recommend this race – the event was well-run, and the volunteers were great! The season opener is always a good time to get those “stupid” mistakes out of your system. Yes, in my 8th season of racing, I still make some pretty dumb moves! The first one should’ve been pretty obvious – I made the decision to race without a watch. I really didn’t want to focus on my splits, and be focused on time. Before the race even started I realized that without my watch, I had no way of knowing when to take in nutrition. Yeah, that’s a pretty big one! Luckily the bike was a 3 loop, out-and-back, so I was able to “guesstimate” when to eat. To say I was anxious to race is a huge understatement. I had been looking forward to this race for weeks – my training has been going well and I had been feeling good all around. I started in the 2nd wave, 3 minutes behind wave 1. My anxiety got the best of me, and I went out pretty hard – keeping up with most of the lead men in my heat. I was feeling great, but the run course had some hills to it, and I was quickly realizing that I may need to pull back a little. But I had it in my head that I needed to catch as many females in the first wave as I could. 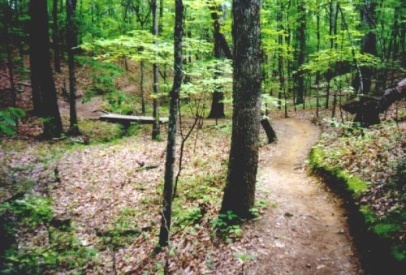 Towards the end of the first loop, you run about a 1/2 mile on single track trail. When I hit the trail it felt amazing! I felt a surge of energy and it reminded me just how much I love trail running. It was a bit challenging because by that point I was passing a lot of runners from the first wave, but they were all extremely considerate in making room to let me pass. The second loop was much better as the runners thinned out (we also raced with the short course athletes who did 1 loop). When I came into T1 I was told I was the 4th overall female. Time to do some work on the bike! The bike course had some nice rollers, which I was well-prepared for with my southern PA training! After the turn-around on the first loop, I passed the 2nd overall female on an uphill, so there was only 1 left in front of me. I had no idea where she was (or even who she was) so I just kept riding my race. The first loop felt great, but again I feared that I had gone out too hard, and the next two laps I was starting to feel the energy draining out of me. Normally I am really excited to get off the bike and run – I feel that’s my strength. But today I was actually dreading the run…I was feeling spent! For the second run you do the loops in reverse, so the trail section is first. I felt really flat on the run, so I was looking forward to getting to the trail to get that feeling I had on the first run. That didn’t happen – I was struggling to lift my feet over the roots and the trail section felt twice as long! At the turnaround I saw a female who started in the wave behind me. I knew she was within 3 minutes of me, and with the way I was feeling, was sure she would pass me on the 2nd loop. I tried not to let it get me down, and kept running my race. By the 2nd loop I was feeling better, and by the turnaround I realized I could hold her off, although she would still beat my overall time. Thanks to a nice downhill finish, I was able to produce a decent kick and come in strong. I was happy to be finished! I was pretty bummed that the 2nd overall female had raced the elite race the day before – and still was able to beat me by 38 seconds! I was even more bummed when they posted results, and saw that the 1st overall female’s bike split was over 10 minutes faster than mine. OUCH! Just when I thought I was getting stronger on the bike… But I had a great time after the race hanging out with Shannon Dawkins, her husband, and their adorable foster puppy. 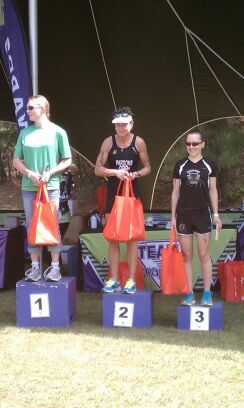 She also rocked it with an age group win and 5th overall female! I came out of that race with some lessons learned and a game plan moving forward. I cannot let the excitement of racing get to me and allow me to go out too hard like I did that day. I didn’t start that race feeling 100%, so I really needed to reign myself in and not blow up that early in the race. And now it’s back to the drawing board with my training – someone needs to focus on getting stronger on the bike 😉 Nationals is a month away and I feel that with some fine-tuning, I will be ready for a strong performance in Tucson!